Barnstorm Creative » Across The Nation Craft Beer Collaboration! Across The Nation Craft Beer Collaboration! Sometimes we are fortunate enough to come across a project that is just plain fun to sink our teeth into!… and it involves BEER! 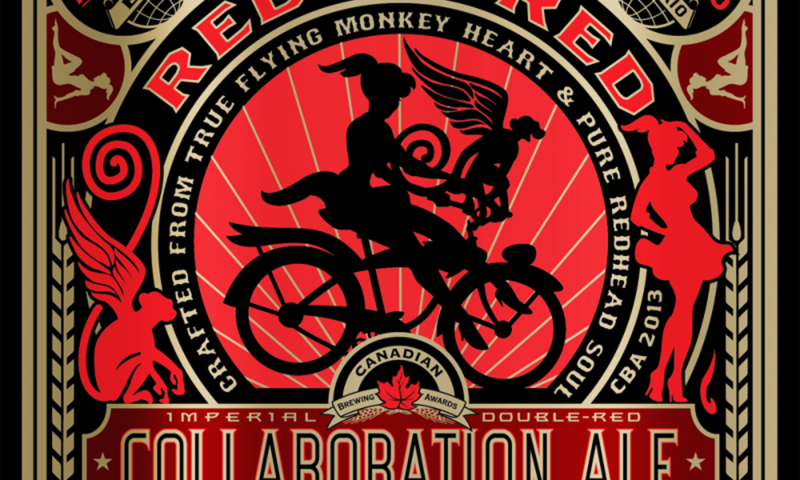 BC’s Central City Brewers + Distillers and Barrie Ontario’s Flying Monkeys Craft Brewery joined forces in the true spirit of craft brewing to collaborate on a east-meets-west “Collaboration Ale” In honour of the 2013 Canadian Brewing Awards in Victoria. Working with input from the creative teams from both craft breweries, Barnstorm is honoured to have created this limited-edition melting pot of a collaboration label worthy of this seriously fun and tasty Double Red Collaboration Ale. Watch for the Brew, the Tee-shirts and the Posters to be showing up in your favourite local establishments! Cheers to our friends at Central City Brewers + Distillers and all the fine folks back east at The Flying Monkeys Craft Brewery! Good luck to everyone at the 2013 CBA’s and keep up the true spirit of collaboration. We’re all on this ride this together!